The Pittsburgh Penguins and the Florida Panthers met for the second half of a home-and-home series on Monday night. The Penguins had won a tough and physical 3-1 game on Saturday night behind the goals of Nick Spaling, Derrick Pouliot, and Sidney Crosby. Pittsburgh’s battle with the mumps virus continued on Monday night as Steve Downie, Thomas Greiss, and Brandon Sutter all missed the game due to medical quarantine. Greiss had previously been tested and deemed healthy by doctors, but his surprise deactivation forced goaltender Jeff Zatkoff to catch a last-second flight down to Miami to fill the backup role. In light of the quarantined players and with former “Iron Man” Craig Adams still out with injury, the Penguins dressed Taylor Chorney, Scott Harrington, and Derrick Pouliot to ice a full team. Right off of the opening faceoff, Malkin nearly found himself alone on a breakaway but the puck trickled off of his blade. Malkin and the Penguins managed to corral the puck and feed Nick Spaling, who missed on an excellent scoring chance from point-blank range. The rough, aggressive play that had defined the teams’ previous meeting on Saturday night seemed a relative thing of the past, as only a handful of mini-scuffles happened. Pittsburgh opened scoring when Simon Despres launched a shot from the point and Patric Hornqvist deflected it home to give the roster-strapped Penguins an early 1-0 lead. Crosby picked up the second assist to move him toward the league leaders in scoring. Florida charged up the ice after the ensuing draw at center, but Jimmy Hayes’ scoring chance was shut down by Fleury and the collapsing Penguins’ defense. Midway through the first, Rob Klinkhammer drew an interference penalty, but the Penguins’ powerplay was unable to produce a goal. Crosby had the best chance, nearly banking in a crafty wrister off of a Panthers’ defenseman, but Luongo made the stop near the goal line. The rest of the first stanza consisted of choppy play as neither team was able to generate much in the way of sustained offense, although with just over a minute left, Crosby had a partial breakaway coming down the left wing. With the Panthers’ defenseman Willie Mitchell at his hip, Crosby was unable to feather a far post shot past the Florida netminder. Once again, the Penguins generated immediate offense after the pucked dropped, with both Comeau and Malkin creating scoring chances for Pittsburgh. Immediately after his shot attempt, Malkin took a bad tripping penalty in the offensive zone and sent the Panthers out onto the ice with the man advantage. The Penguins’ PK unit, missing usuals Brandon Sutter and Craig Adams, immediately gave up a scoring chance along the goal line, but Fleury stopped him with a sprawling save. Following a nice effort to keep the puck in the offensive zone, the Panthers hit a post but failed to score. Pittsburgh sent Florida right back to the powerplay after Blake Comeau took an unnecessary interference penalty. Following a smattering of Panther shots, the Penguins notched their second straight penalty kill. The successful PK kept the score at 1-0 despite Pittsburgh being outshot 8-1 in the first 6 minutes of play. Chris Kunitz rang a shot off the post off of a slick Crosby feed, with Florida taking a penalty on the same shift. Following a neat keep-in by the Penguins that included a soccer-style pass by Crosby along the boards, Hornqvist barely missed a shot from the left circle (once again set up by Crosby). The intensity of play rose significantly after Kris Letang stood up Nick Bjugstad in the center of the Pens’ defensive zone. Following a Bobby Farnham chase of a loose puck (ultimately deflected away by Luongo), Florida’s Sean Bergenheim dropped Farnham with a dangerous late hit, but no penalty was called. Almost immediately thereafter, Florida went back to the powerplay after Simon Despres’s stick-check on former Penguin Jussi Jokinen shattered Jokinen’s stick, drawing a slashing call. Rob Scuderi made a tremendous defensive play on Jokinen during the Panthers’ power-play, not allowing a shot to get through, but the Pens were caught scrambling following a breakdown, and with Fleury’s stick off in the corner, Jokinen beat a slightly off-line Fleury to tie the game at 1 with less than a minute left in second period. Jokinen’s goal came shortly after Despres’s penalty expired, but the successful penalty kill was of little solace to the Penguins, who retreated to the locker room knowing they were in for a tough final period. This time, it was Florida that tilted the ice right after the puck dropped, and this time, the scoring chance was converted. Florida's goal was their second within a minute, with Jimmy Hayes beating Fleury via a corkscrew of a shot from in tight. Now trailing by a goal, the Penguins attempted to push their offensive agenda but the Panthers nearly converted via a 2-on-2 counter-attack, with Hayes being denied by Fleury. The Penguins then missed a wide open net from the right of Robert Luongo. Crosby simply fanned on a hard pass across the goal mouth, and Bjugstad dumped a shot into Fleury's crest on the ensuing Florida transition. Hayes would strike again four minutes later, collecting a garbage goal from inside Fleury's crease. The Panthers' goal put Pittsburgh down 3-1 with just over fifteen minutes left in the third. With just under 7 minutes left to go, Malkin drew a slashing penalty to give the Penguins a chance to close the gap. Pittsburgh got a puck past a screened Luongo as Nick Spaling got a piece of Pouliot's wrister from the point to close the deficit to 3-2. 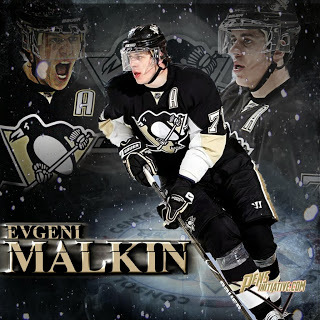 Malkin then tied the game at 3 with what can only be described as a bullrush. #71 came from behind the net to stuff the puck through Sweet Lou on his third whack and caused the Penguin fans in attendance to erupt. The Pens were content to let the time tick down and take their chances in overtime. Florida outshot the Penguins 34-23 in regulation while Pittsburgh dominated in the faceoff dot, winning 57% of draws. Jokinen got the first scoring chance in OT, and after Malkin was dragged down in his own end, Florida nearly scored on the ensuing overload. Teams traded end to end rushes, with both Malkin and Crosby rocking shots off of Luongo. Letang thought he had won it when his shot rang off the near post, and after Jokinen missed Campbell in the Pens' end, Pittsburgh held the puck in Florida's end but couldn't get a shot through. The Pens then survived a bad turnover in the neural zone, and Crosby's slapshot as time expired failed to elude Luongo, bringing on the shootout. Malkin went first for the Penguins and tried to get Luongo to commit, but Sweet Lou stopped him easily. Brandon Pirri then tried a similar move on Fleury, but Fleury held his ground and turned him aside. Sidney Crosby then attempted roughly the same move, once again failing to score. Vincent Trocheck went next for the Panthers and promptly fanned on his scoring chance. Kris Letang went to his patented backhand move, but Luongo stayed down to deny him. Bjugstad tried to beat Fleury cleanly with a wrister, but he made the save. Kunitz's deke fooled Luongo, but he reached back and kept the puck out of the net. Jonathan Huberdeau had plans to drag the puck around Fleury, but #29's poke check knocked it away. Patric Hornqvist then came with speed but couldn't beat Luongo on a straight deke-to-backhand move. Jussi Jokinen tricked Fleury, but Jokinen missed a wide open net with the puck sailing into the stands. Derrick Pouliot skated in and tried to go top shelf, but Luongo's positioning was excellent and denied him. Dave Bolland came with speed and just couldn't beat Fleury 5-hole, keeping the shootout going. Simon Despres then tried his luck, weaving and weaving until he ran out of room, giving Luongo an easy save. Finally, Aleksander Barkov stretched down and flipped a sly backhanded over Fleury's left pad to give the Panthers the 4-3 win.